It has been quite the kickoff for the Massachusetts Pirates, as the team has hit the ground running with a 4-1 record as well as the first place position. While it has been a team effort so far, one part of the Pirates’ early success is wide receiver, Devonn Brown. Brown played his college football for Lamar University and recorded 59 receptions for 906 yards and eight touchdowns using speed to grab an average of 15.4 yards per catch. After college, he spent time in the Indoor Football League with the now folded Spokane Empire where he caught four of quarterbacks Charles Dowdell’s seven touchdown passes against the Colorado Crush in March 2017. The 25-year-old has continued his leading role this season with the Pirates, leading the team in total yards receiving and 11 touchdowns. Team president and director of player personnel Jawad Yatim said he received a push from offensive coordinator Anthony Payton to sign Brown to the newly formed squad. Yatim said Brown has made a huge impact on the team in their inaugural season. The ownership has been impressed but so has head coach Ameer Ismail who says it’s a privilege working with Brown. 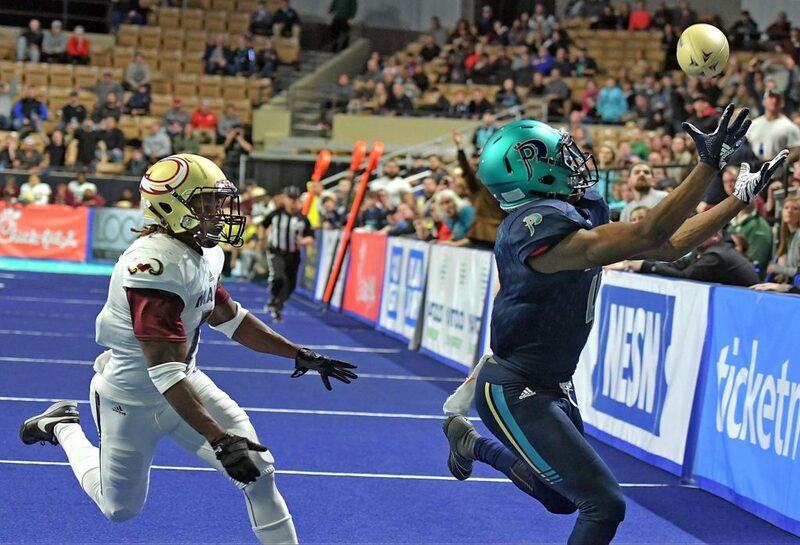 Pirates quarterback Sean Brackett said he has the utmost respect for his speedy receiver and that his talent puts him up there as one of the best Arena Football has to offer. Brackett has even gone so far as to say that Brown is one of the best he’s been on the field with. Brown said he always thinks there’s room for improvement in his game as the Pirates continue their season. Playing football all around, Brown has taken to the state of Massachusetts and believes the fans are some of the most passionate around. Although he is in his first season with the team, Brown said he has big goals for this year.